There is a tremendous channelling of Flow this week. Whilst the overall level of Flow remains constant it has some very interesting changes of direction. At the moment you may be feeling under a fair amount of pressure. No, this is nothing to do specifically with the run-up to Yule. It’s much more to do with the fact that you have been planning and brooding on your thoughts and your potential actions for quite some time now. This has built up a tremendous pressure in your psyche. Things are about to change – and in a very interesting way. What might not have been clear to you is the fact that in the process of getting your thoughts, actions and plans together you have been able to get rid of a lots of unnecessary material. This has been like polishing a diamond. It has enabled your mind to find not only what is worthwhile and important to you but also to find out what is important to others. You may not have planned to be influential, only clearer. But the Flow indicates that a lot of the thoughts and changes you have been experiencing have much deeper roots. When you start to speak and let your spirit through this week you will find all sorts of new channels opening to you. And ability to connect at a much deeper level than before. This in itself would be an interesting feeling for you. It would almost seem like some kind of mental relief. You will feel able to communicate your thoughts and feelings easily. What you say will seem to carry additional weight somehow. Not only that but when you hear yourself explaining and sharing with others you will find that you will even make sense to you! You will find that the work you have done has enabled you to reach deep human and spiritual themes with which others readily identify. Not only that, but these will be true and come from deep within you. There is a spiritual genuineness about your motives and your connection. You’ll find that you will be left with insights about yourself, for sure. And you will also find that your words carry much further than people’s ears. It will carry to their souls. Don’t force it, just let it happen. Speak from the heart and the minds and actions will follow. There were no Rogues this week. 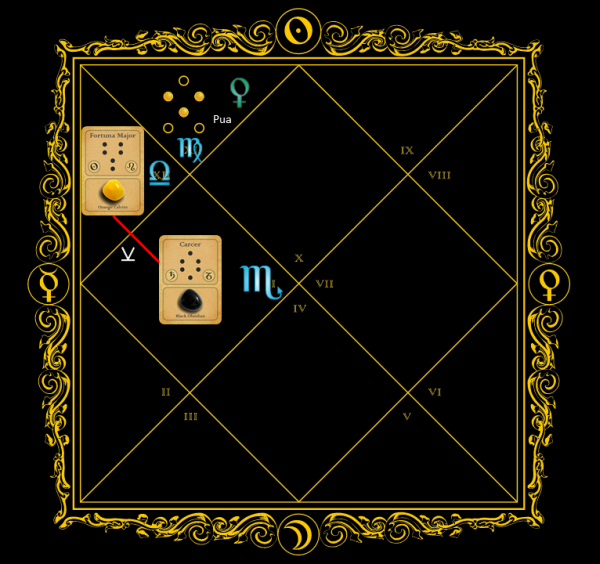 This is a lovely flow of Carcer in the first (Scorpio) producing a tremendous head of power and potential. This gets reflected through Fortuna Major in the 12th (Libra) to enable beautiful and balanced thought-connections with others. This in itself would be a bursting and channelling of all that pent-up personal work you had been doing. But the Flow goes further when we consider the Active Transform Amissio (14) in the 11th house (Virgo). Look at the story of the taps: it’s a story of two taps at Level 3 in Carcer shifting to 2 taps at Level 1 in Fortuna Major and then back down to 2 new taps in Amissio (14). What was bottled and pressured gets its release in connection with others followed by a flowing outburst of connected actions. A lovely present for the spirit just before Yule!